My bike was out of action and I hadn’t even started cycling! I was waiting for the train to Aberdeen to take me to the start of my route and now I had a limp tyre and no means to fix it. In fact, this was triple disaster! It was pouring with rain and I was dripping wet. I had to wait almost one hour for the next train to Dyce. A long wait for the sake of a short ten minute train journey, but my bike was back in action and that was all that mattered. At Dyce I started on the Formartine and Buchan cycle way, each pedal stroke all the sweeter because Plan B had worked out. This path used to be a railway line that connected Aberdeen to the towns of Fraserburgh and Peterhead. The route is 53 miles and I planned to travel all of it over the next few days. This was familiar ground for me as I had previously ridden the section from Dyce to Ellon, which can be read in Riding the rails. My newly repaired tyre got me as far as Udny (9 miles) when I discovered it had gone flat again. I carried out the repair under the shelter of a bridge that steam trains once chugged under. My bike looked pathetic, like some sort of carcass with the wheel off, and inner tube spilling out. The heavy rain became light drizzle. For a while it annoyed me because my clothes and face were constantly wet, but then I thought about it differently. I compared this light spray to one of those aromatherapy “facial mists” that come in bottles and are quite expensive. My facial mist was free, would not run out and would keep my face refreshed without the need to press on an aerosol pump. It was more challenging to think positively about the mud. My clothes and panniers were totally caked in it. The faster I went the more I got splattered. But then it started to feel liberating to be a mess. I was not going into work and did not need to be neat and smart. My bike was churning the gravel path and startled a Peregrine Falcon to launch from a branch as I approached. He was already a distant speck by the time I reached the branch- this is the fastest animal on the planet and can reach speeds of over 200 mph. Although nature has reclaimed most of the line there are signs of railway everywhere- it was only in 1979 that the Fraserburgh section closed. There are tunnels, bridges, overgrown platforms and telegraph poles- even some of the ceramic insulators from the poles are still in situ. 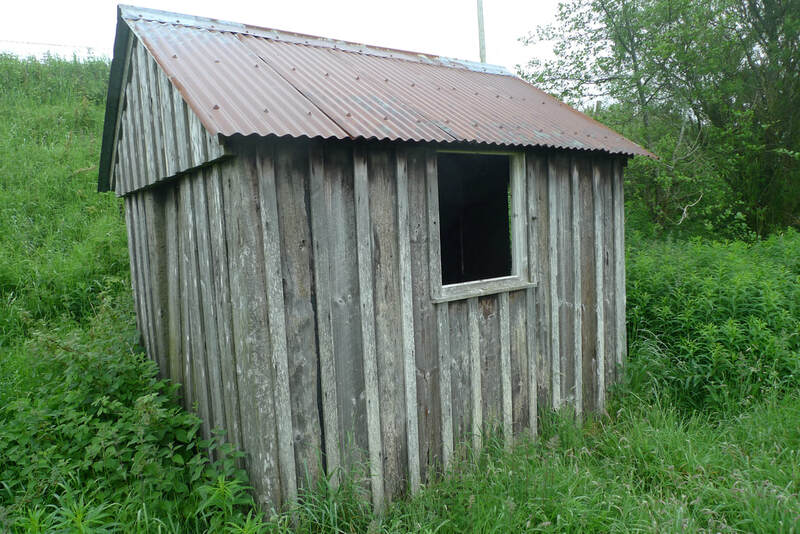 There are wooden or concrete shelters that had once been used by maintenance men looking after the line. Some are dilapidated and overgrown with tall grass and nettles, others still have roofs, chimneys and doors. But the biggest hint of the railway past is at Maud Station. A train could easily pull up at that moment and not look out of place. I was the one out of place, cycling between the platforms where the track should have been. 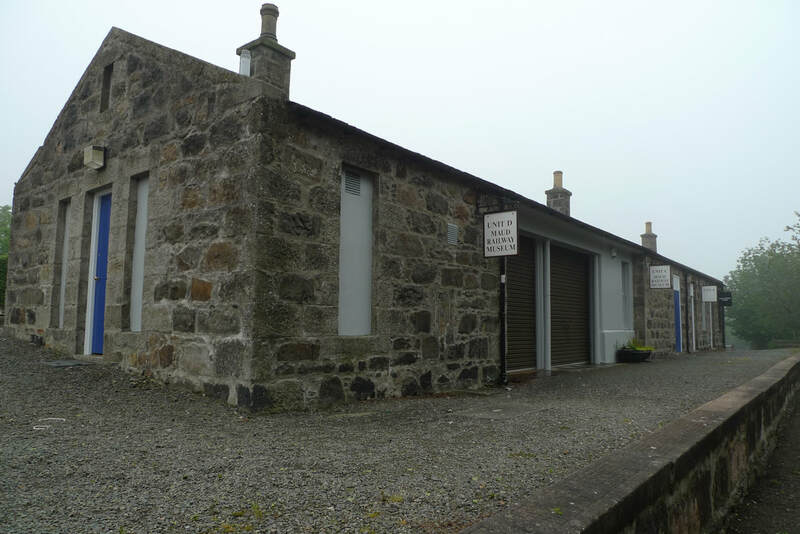 The stone buildings look ready for passengers to come inside and buy tickets. There is even a white picket fence. I could easily imagine a polished boot stamping out a cigarette on the faded white edging, before the owner of the boot steps aboard the morning express. It felt unnatural to be swinging my legs over the sides of the platform whilst eating a chocolate fudge slice bought from the nearby grocery store. At one time there would have been shouting, clanging and chugging. This had been a place of activity, a focal point of the community where many conversations took place, goodbyes and hellos were exchanged. Nowadays the stillness is only interrupted by crows making a fuss and the occasional car pulling up at the grocery store. Normally I enjoy being on my own, but the drizzle gave way to an eerie mist which dramatically changed the atmosphere. It cut visibility and I felt like I was travelling into an abyss because I could not make out the landscape, only the straight gravel path. The mist seemed to stifle all sounds. It intensified a feeling that I could easily be the last person left in the world. It was another puncture! I had to replace the inner tube and it took me half an hour. I decided that this must be a sign to give up on reaching Peterhead. I had to double back anyway because my accommodation for the night was near Mintlaw which I had earlier sped through. I was possibly only 4 miles from my goal, but I could not risk another puncture, it was getting late and the mist was increasingly spooky. Peterhead would have to wait for another day. The Old Shooting Lodge is made of granite and has antlers on the walls. The owners were getting a new kitchen put in, so had moved me into their self-catering cottage called Willow Lodge. This definitely worked in my favour as I had lots of space to spread out, including a kitchen and living room with a skylight. The Lodge is located behind the Saplinbrae House Hotel where I could get something to eat in the “snug bar”. “Order food in five minutes or its beans and toast. Chef’s orders!” Luckily this was not directed at me, but a local man. I had walked in on some banter. There were children running and playing. Everyone seemed to know each other and I felt like the odd one out. I sat quietly with creamy Cullen skink and chunky Arbroath smokie fishcakes. An Australian man was telling the barman about his search for a USB in Mintlaw. He had asked in the Costcutter shop where they did not have them, but the man there suggested he tried the Garden Centre. They also did not have them. He was about to give up when he saw the man from Costcutter running towards him, clutching a USB and saying “I forgot, somebody gave it to me and I don’t need it. I went home to get it. You can have it.” The Australian was amazed at this kindness. I returned to Willow Lodge and made use of the breakfast table to finish my note taking and hoped that tomorrow would bring sunshine and no more punctures. The Formartine and Buchan Way begins at the back of the car park in Dyce station. There is a blue sign marking the start of the Way. It is 25 miles to Maud where the path splits. The north path heads to Fraserburgh (15 miles) and the east path takes you to Peterhead (13 miles). 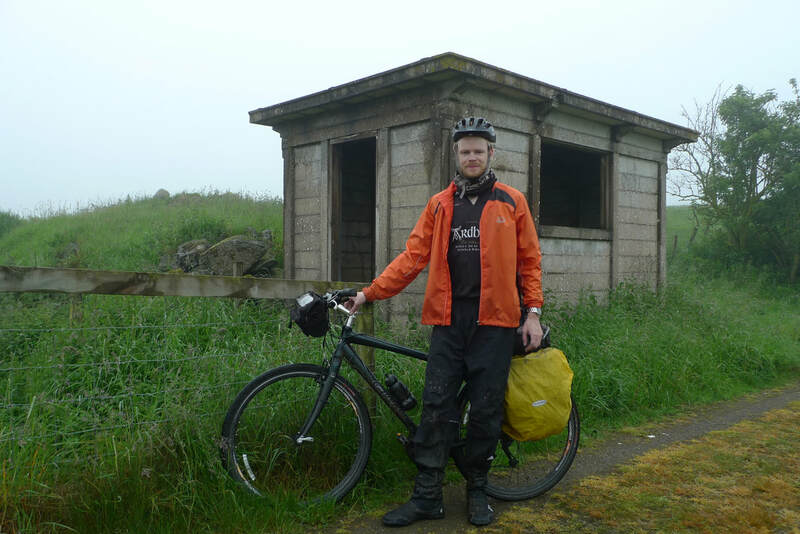 My original plan was to cycle to Peterhead and then return to Mintlaw where I had booked a room, but I did not quite make it because of punctures. Mintlaw is 5.5 miles from Maud. This is as easy as cycling gets. Flat, no traffic and impossible to get lost. The surface varies from tarmac to gravel and paths that turn to mud in wet weather. It can be slow going on some of the surfaces, particularly the chunky gravel. In the sections near the bigger towns like Dyce and Ellon they can be busy with joggers and dog walkers. ​Haddo House is near Ellon and can be visited only on a guided tour, but is free to visit the grounds. There is a tearoom in the stables. You can read about my visit to Haddo House in Riding the rails. 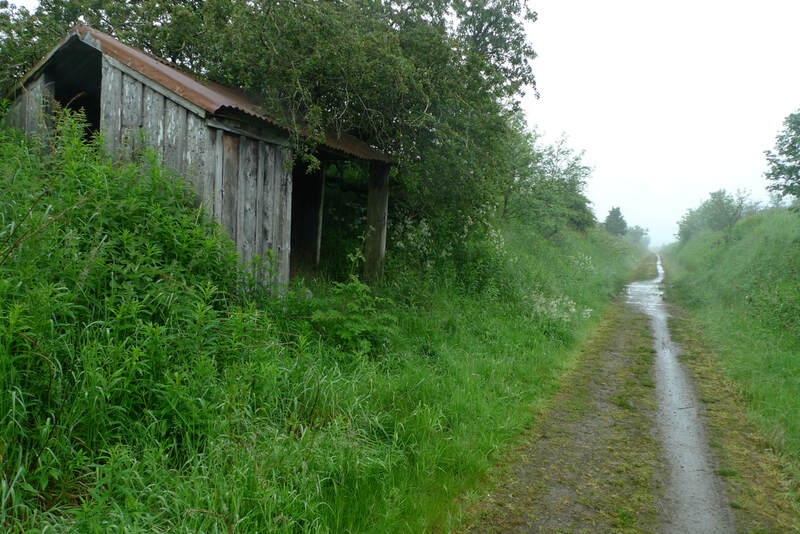 To reach the Old Shooting Lodge It is better to leave the cycle path at Old Deer because the Lodge is located nearer Old Deer than Mintlaw. If you get off the path at Mintlaw there are busy roads and you have to take the A950. Just look for the sign for the Saplinbrae House Hotel- the Old Shooting Lodge is behind the hotel. 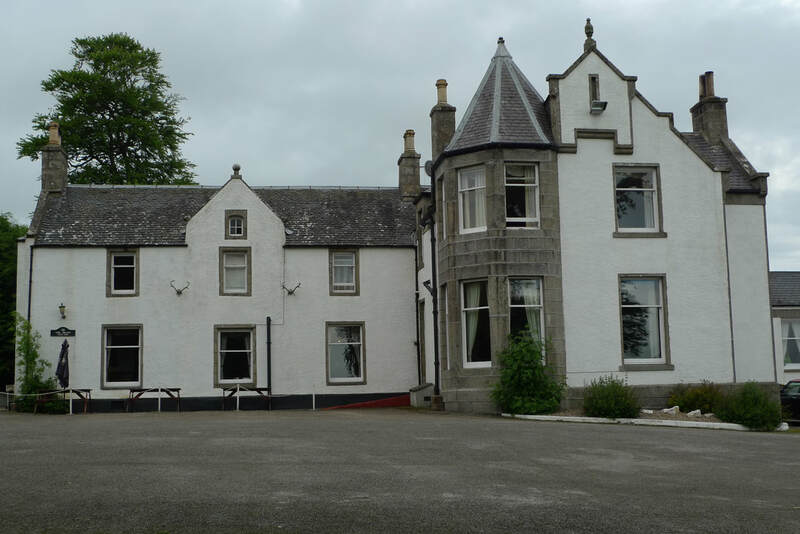 The Saplinbrae House Hotel is convienient for dinner, otherwise you face cycling along the A950 into Mintlaw. This might be worth it because the chip shop in Mintlaw has won the British Fish and Chip Shop of the year competition.